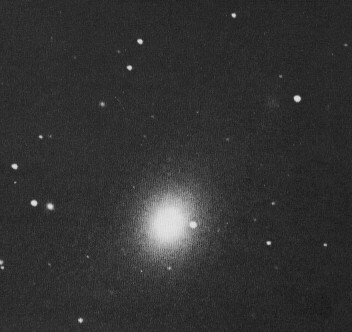 Elliptical galaxy Messier 49 (M49, NGC 4472) is one of the brightest member galaxies of the Virgo cluster. 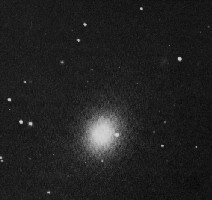 M49 was the first member of the Virgo cluster of galaxies to be discovered, by Charles Messier, who cataloged it on February 19, 1771. It is also the second galaxy discovered beyond the Local Group after Lacaille's discovery of M83. Eight years later, on April 22, 1779, on the occasion of following the comet of that year, and on the hunt for finding more nebulous objects in competition to other observers, Barnabas Oriani independently rediscovered this "nebula." In his Bedford Catalogue of 1844, Admiral William H. Smyth confused this finding with Messier's discovery and erroneously stated, "This object was discovered by Oriani in 1771." This error was repeated by John Herschel in his General Catalogue of 1864 (GC), who also erroneously assigned this object to "1771 Oriani," and also found its way into J.L.E. Dreyer's NGC. M49 is one of the brightest Virgo Cluster member galaxies with its mag 8.5, which corresponds to an absolute magnitude of approximately -22.8, regarding its distance of about 60 million light years. It is one of the giant elliptical galaxies in this great cluster (besides M60 and M87), and is of type E4 in Hubble's classification scheme. Its extension of 9 x 7.5 arc minutes corresponds to an ellipsoid with a projected major axis of nearly 160,000 light years (we don't know the real extension along the line of sight toward us, of course, as we don't know the spatial orientation of the real ellipsoid axes), so it is actually a big ellipsoid. Older estimates have suggested a mass which might be bigger than that of the nearby giant M87, but now it is assumed that M87 is much denser. With its integrated spectral class G7 and color index +0.76, it is yellower than most galaxies in the Virgo cluster. Longer exposures show a system of globular cluster, which however is much less crowded than that of M87 and more comparable to that of M60. According to W.E. Harris' list, this galaxy has a system of 6300 +/- 1900 globulars. The fuzzy nebulosity near the brighter star in the upper right is probably a faint, small companion, as it also appears in the DSSM image (observe the reverse orientation of these images, however). In that image, many more faint companions can be seen, among them the relatively bright peculiar galaxy NGC 4470 (photographic mag 13.0). The foreground star was first mentioned by John Herschel and is of mag 13, so that it might be erroneously taken for a supernova by observers unfamilar with this galaxy's appearance. Halton Arp has included M49 as No. 134 in his Catalogue of Peculiar Galaxies as an "Elliptical with Nearby Fragments". A probable supernova, 1969Q, of mag 13.0 was reported in this galaxy in June, 1969.